Close your pool properly ! Simply add these Commercial Quality winterizing chemicals to your pool and you can insure a crystal clear start up in the spring! 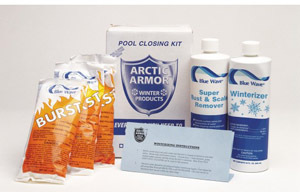 These Winter Kits are specially formulated to work in the cold still water of your pool during the winter months. They have everything you need to close your pool this fall. All kits are formulated for specific pool sizes - just order the kit to fit your pool. We offer two types of kits, a chlorine based kit and a non-chlorine based kit. 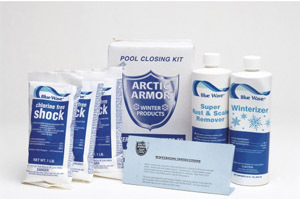 Close your pool properly this fall and ensure a sparkling clean pool next spring with our Winterizing Kits. 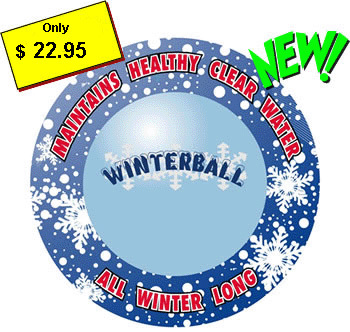 Super Winterball is the all natural enzyme product that keeps your pool clear and stain-free all winter long. Developed for the medical industry, this concentrated enzyme will work in conjunction with your regular winterizing kit for best results - especially with Mesh or Loop Loc type covers. Super Winterball contains 16 oz. of liquid formula and its patented delivery system slowly releases its natural enzyme all winter long. Safe for use with all types of pools and filters and winterizing kits. All natural formula. One Super Winterball treats up to 30,000 gallon pools. CHEMICAL KIT FOR BEST RESULTS ! DUE TO OUR SHIPPING REGULATIONS, WE CANNOT SHIP POOL COVERS OR POOL WINTERIZATION CHEMICALS OR SUPPLIES INTERNATIONALLY.